Having recently enjoyed a nursery tour at Village Nurseries (wholesale only) highlighting several newly introduced plants, I’ve compiled a short list of what I consider to be the best new landscape plants for 2016. It was explained that it costs thousands of dollars to bring a new plant to the market place and also several years to do so. Plant breeders and nurserymen are thrilled to bring new plant varieties to the public and Village Nurseries does a great job enticing landscape designers and architects to utilize these new plants in our designs. Besides, what client doesn’t want to the very best, newest plant in their yard to boast to friends and neighbors? My short list includes a few new succulents as they are ever so trendy. Also included in the best new landscape plants for 2016 are a few ornamental grasses (one of my favorite plant types) and a new take on an old favorite…. Bottlebrush. See the list below to join the crowds who savor these new choices. Aloe ‘Always Red (see above) is an amazing bloomer, 12” x 14”. This could become a new favorite to include in Xeriscape and Succulent gardens with is continual display of brilliant red flowers. Hummingbirds will love this one. 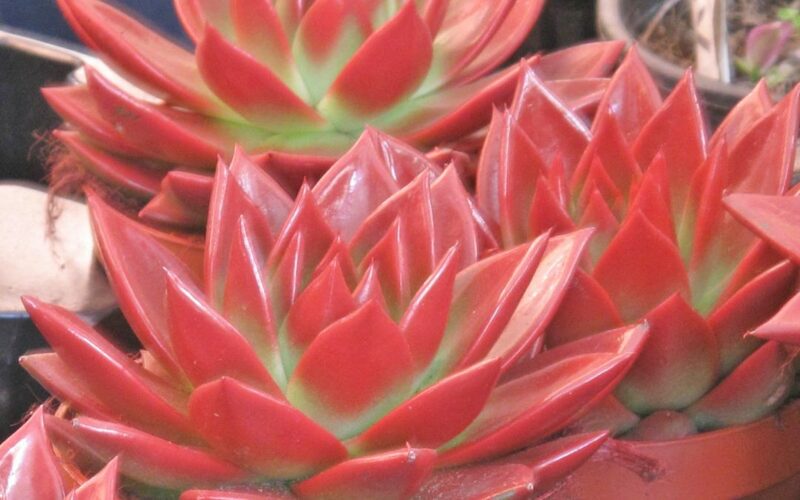 Echeveria agavoides ‘Rose’ is a new succulent addition. Still on the small side, this one is BIG on color, living up to its name with a rich blend of rose and green. Beschornia y. ‘Flamingo Glow’ (Flaming Glow Mexican Lily) is a major player when it comes to adding drama to a garden. It can reach 4’ to 6’ high and wise. In the summer it sports 6 feet tall pink flower stalks. It is drought tolerant, likes full sun and even survive temperatures as low as 15 degrees. Miscanthus ‘Little Miss’ is a smaller fountain grass growing 2-3 feet high. Note the rich burgundy color; this is a great alternative to the typical Purple Fountain Grass. Melinis nerviglumis ‘Savannah” (Ruby Grass) is destined for high demand now and in the future. It is only 14” to 18” tall and 10” wide with spectacular blooms that start out red and fade to white. And, the foliage starts out blue-green turning to purple in the fall. John Greenlee, noted nurseryman and grass expert call this plant “one of the showiest of the small flowering grasses”. Callistemon ‘Bottle Pop Neon Pink (Pink Bottlebrush) is one other new introduction, offering a true neon pink blossom. Growing 6 feet tall and 4’ to 6’ wide, it offers a great display and attracts plenty of bees and butterflies. (see below right). So that is a sampling of wonderful new landscape plants for 2016! If you’d like more information, contact me at Letz Design Landscape to learn about more or how you too can be the first on the block to have the best products growers are offering now. Stay tuned as there are constantly new plants to enjoy.